Should I Be Able to Photograph My Food? Due to the uproar that has stemmed from the new policy at Momofuku Ko whereby diners aren't allowed to take photographs of their food, I thought it was a good time to take a look at what has become an issue in the dining community. There was a post about it on Serious Eats, and the follow up comments do a good job of demonstrating how opinions are split on this topic. From my own perspective (not forgetting that I am biased since my blog is replete with photos of the food I have been served,) I think there are three issues at play here. Should it be banned because it bothers other diners? I've heard this one argued extensively, and despite the fact that I think that it should be banned if it indeed does bother other diners, I have yet to see a single diner complain about it. And I am someone who has taken thousands of photos at restaurants and never once have I ever had a single complaint. And I use a flash extensively. But the truth is, the range of a flash is so narrow that you can hardly see it at another seat at the table let alone another table. In fact a number of years ago there was a very long and contentious discussion about this on the OA discussion forum. Then one night there was a dinner at Eleven Madison Park where I was shooting photos with a flash, and the next day they turned up on the site and the person sitting directly across from me commented that they hadn't even realized that I was taking photos with a flash. So much for taking pictures actually bothering people. But if I had to take a guess at what causes the split of opinion, it has to do with people wanting to control the environment that they eat in. Each of us have a different relationship with food. I believe that what causes people to say they are against photography in restaurants, even though they have never complained about people who are taking photos, is that they want their sensibilities about dining to dominate the social situation. I run into a similar problem when I discuss cuisine in terms of hierarchies in order to rate food. 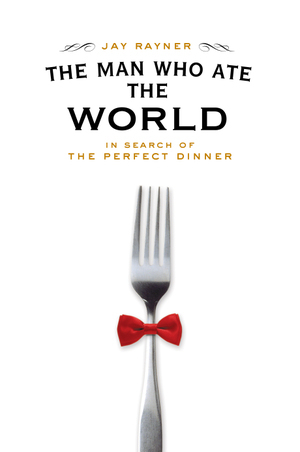 Some people simply want to enjoy their dinner and they are not interested into entering into a comparative discussion about where the meal ranks in the annals of dining. And while there is nothing wrong with that, why do they care if I like to do that? Yet you can't imagine how many times people have complained to me about it. It always makes me wonder, since they aren't interested in discussing cuisine from that perspective, why do they care that other people do it? But for some reason they feel threatened by the idea that people have a different relationship with the dining experience than they have, and if I had a Euro for every time someone interrupted a discussion to say something like "can't you just enjoy your food," I would be jetting off to have the tasting menu at Marc Veyrat this weekend. Taking photos in restaurants seems to fall under the same category. Lots of people who complain in concept, but I've never seen anyone actually complain, or articulate a legitimate reason why it should be banned. Does a photo of food violate a copyright that is owned by the chef? The simple answer is no. Yet some chefs try and claim that a plate of food has some sort of copyright protection. As someone who owns hundreds of copyrights and a number of different trademarks, I have yet to see someone state a case for it that makes sense. Still, I've been prevented from taking photos at Pierre Gagnaire because the restaurant was claiming that there was some type of intellectual property rights that they owned over the finished dishes. This explanation smelled fishy to me and I pressed the Captain on it until he finally admitted that he knew I was right. What the restaurant was actually trying to protect was their commercial rights which are discussed in the paragraph below. Does a chef/restaurant owner have a valid commercial reason or right to ban photography? The answer to this one is an unequivocal yes. But not because what they serve on a plate can be protected as intellectual property, but because they are allowed to control the environment in their restaurants for a number of commercial reasons that have nothing to do with whether photos bother other diners. First of all, they may view their cuisine as some type of trade secret, and they want to prevent competitors from easily copying their creations. This is why Starbucks doesn't allow you to take photos in their stores. They don't want their competitors to have easy access to how they put their installations together. If you walk into any department store like Macy's or Nordstrom's, you will find the same policy. But while I understand why Bloomingdale's would want to prevent Sak's Fifth Avenue from having photos of the way they are marketing certain designer goods, Gagnaire's thinking here is misguided. Unlike point of purchase displays, a chef's reputation relies on what he creates. Why would a chef want to cut off public access to his creations? The argument for it would be that if other chefs were able to see what Gagnaire was preparing, they would copy it and he would lose business as a result. But the fine dining community doesn't work that way because diners want to experience culinary creations at their source because of the unique hand of the chef. People interested in the arts don't want an imitation of Picasso, they want the real thing. The other reasons have to do with public inspections by the health department etc. Let's say that a restaurant has a water circulate but has not been approved by their local health department to cook using sous vide, and photos make that easier for the health inspectors to spot. Or how about employees not wearing gloves when they are supposed to and they are caught on camera and the restaurant gets in trouble for it? I'm sure there are other back of the house reasons for banning photography that I'm overlooking but you get the idea that this could be a problem. So Should They Allow it or Not? Given the above, I just don't see the argument for not allowingphotography in restaurants. Even concerns about health departments are mitigated by the free publicity a restaurant gets by allowing bloggers to take photos of their delicious cuisine. And if that means that the staff needs to dress a certain way, or to use certain equipment to come within the code, or to get approval for certain cooking techniques, the trade-off for the free publicity seems more than worth it. And for those of you who object to the practice of diners taking photos of their food, even though you haven't been able to offer any evidence that the practice bothers you in any tangible way, I wish you good dining on your own terms, provided you wish the same for me on mine. In a recent article in London's Telegraph newspaper, Santi Santamaria, chef/owner of El Raco de can Fabes in Sant Celoni, Spain, has accused El Bulli's Ferran Adria of "unethical" cooking practices because he uses additives like methylcellulose in his cuisine. Santamaria also implies that Adria's cooking is "dangerous" and has the potential to "poison" diners. He even delves into the aesthetics of cuisine by saying, "cooks should not be preoccupied with creating sculptures or painting pictures with their work. A table is not an art gallery." The full article is available here, Ferran Adria accused of 'poisoning' his diners. Santamaria's arguments basically fall into two categories. He isn't the first person who has argued that food isn't art and in fact, my blog post, People Who Insist That Cuisine Needs to Be Representative Should Get Over it Already, addresses this very point. Sure the discussion the discussion is heated (take a look at the comments offered in response to my post by the person who goes by the name of Sailly Disciple, an Argentinian born chef by the name of Mariano Belinkey who lives in Barcelona and who claims to know a lot more about food than he actually does.) But Santamaria's charges of modern cuisine causing a health problem for diners, besides exhibiting a level of resentment towards Adria and the modern culinary movement that I personally find astonishing, takes the debate to a new level and it merits a response. First of all, which do you think is worse for your health, the amount of additives that Ferran Adria uses to form the artificial pearl he places atop the Gillardeau oyster he serves or the cholesteral in Santi's roast pork or lamb? Or take Wylie Dufresne's infamous pizza pebbles. Which do you think is less healthy, the pebbles or a greasy slice with sausage and extra cheese at Joe's Pizza on Sixth Avenue? Given that the answer is obvious on its face, and given that Santamaria, whose restaurant is less than 100 kms down the road from Adria's, is perfectly free to use an oven to roast as he sees fit, why offer such charged statements? The answer is stature. Or I should say, a loss of stature for chefs serving Santamaria's style of cuisine within the fine dining community. Let's face it, while Santi can still roast a lamb with the best of them, 10 years ago, many more people would have yelled "hola" when his roasts came out of the oven than are yelling it today. But like other artisans who did not understand how their craft was changing, and who focused on the excesses and exagerations of a movement in an attenpt to delegitimize it as not complying with the rules, Santamaria misses the point as to what the movement is actually based on which is cleanliness and the ability to maximize the flavor of ingredients with a minimal use of fat. I recently had the pleasure of having a long, multi-course lunch at Casa Gerardo in Asturias, a restaurant that Santamaria should visit if he really wants to understand the differences between traditional and modern cuisine (I intend to post a seperate review of my delightful meal at the restaurant.) The final course was the house version of the classic dish of the region, fabadas, a white bean and sausage stew that is a not too distant cousin of cassoulet. 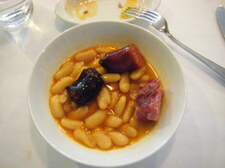 It's a dish that is normally made with dried beans, and as is typical for a stew where dried beans form the basis of the dish, the beans are cooked with fatty meats for a long period of time so they can soften and absorb the flavor of the meat in the process. The result is a thick, heavy, viscose and hearty concoction whose leftovers could be used to heat your home in winter if you happen to run out of petrol. But unlike every other bean stew that I have eaten, the fabadas at Casa Gerardo is light in comparison and much easier to eat. In fact dare say, the dish tasted modern. So I asked 28 year old Pedro Morain, the fifth generation of the family to run the restaurant's kitchen, how he does it and he was more than happy to share the family's secret. "It's a recipe we developed" he told me. "When the fadaba beans are fresh in September, we buy a years supply and freeze them. So because the beans aren't dried, they takes less time to cook and we can remove the sausages from the pan after 40 minutes and then the beans cook on their own for another 20 minutes. The shorter cooking time means less fat in the dish but we don't lose any flavor because the fresh beans absorb flavor more quickly than dried beans." And there it was, the secret of modern cuisine had nothing to do with turning lamb into foam, it had to do with developing culinary techniques that resulted in lighter and cleaner food. Even when preparing dishes that are hundreds of years old. Santi Santamaria would serve himself well to revisit his comments. Maybe even to retract them. And if he would like to regain some of the stature he has lost over the last decade, maybe he should understand that if he wants to continue to cook in the image of Fernand Point, people might still eat, and enjoy, his food, but he won't play an important part in the ongoing discussion about cuisine. If that's what he wants, he is going to have to figure out how to make his cuisine more modern. That doesn't mean he has to cook a leg of lamb by inserting electric charges and detonating them, but it does mean that he has to make his cuisine lighter and cleaner, and most importantly, reduce the fat content in order to make it healthier. It was a time of celebration for the Plotnicki family as my twin sons turned 21 a week ago Sunday. To note the occasion, I booked a table at the Louis XV in Monte Carlo. I hadn't been at the restaurant since the late 1980's, and I have to say I wasn't that impressed by that meal. But since then, numerous people that I know have told me that they think it's the best restaurant in the world -- in fact in the OA survey, many people included that claim in their comments. So returning has been on my agenda for some time, and given that both of my sons spent their spring semester at university in London, we organized a family trip in Europe (family vacations are so hard to come by once your children get older) to celebrate this special occasion. First of all I can say that we all enjoyed our meal. Sure we had various complaints that ranged from the style of the cuisine to the necessity of dining at that level of formality. But unlike other posts on this blog, I'm not really interested in talking about food in this post. I would like to concentrate on something I hardly ever discuss on these forums which is cost. In a word, the cost of a meal at the Louis XV can only be described one way. Outrageous. Sure, I know that I could have availed myself of the lunch menu which is a bargain compared to what they charge at dinner, but this was a birthday celebration that was to be followed by a trip to the casino (one of the privilages you gain when you turn 21) for the occasion so dinner was more appropriate. Mrs P and I started our meal by splitting the Cocotte de Lugumes which were described as "fresh vegetables from the daily market in Nice." The dish, if I recall correctly, cost 104 Euros. What was served was a cast iron pot that contained a thin layer of vegetables in a reduced vegetable broth. Tasty yes but, could the actual ingredients in the pot cost more than a few dollars? In fact I believe I had the exact same ingredients at Mirazur for dinner on Thursday night where, and this is hard to believe, the cost of a nine course tasting menu was less than the cost of this single dish at Louis XV! And the outrageous cost at Louis XV didn't stop there as the gamberoni dish that Mrs P and I split (4 specimens and some clams, supions, vegetables in a lemon sauce) cost a whopping 121 Euros. As I was eating my veggies, I was looking around the room and I tried to figure out the motivation for paying these types of prices for food. Sad to say I couldn't really find any. Sure the room was dripping with all of the indicia of luxury. And while I'm the first guy to enjoy a luxurious dining experience, it's more than a little ridiculous when the cost of luxury adds 80%-90%, or even more, to the cost of the food. No wonder that in order for this style of dining to continue to exist it needs to be subsidized by hotel chains, in this instance, by the Principality of Monaco who feel they need to have a Michelin 3 star restaurant within their borders, but restaurants like Le Cinq and Le Meurice in Paris, just to name two of them, are in the same boat. They simply wouldn't exist, nor would the chefs who man their kitchens cook in their current style, if they had to operate restaurants that were self sufficient and depended on a purely gastronomic audience. At the heart of the development of any aesthetic is the notion of progress -- the concept that the techniques and materials that artisans use to craft their art are always progressing. But in France, because working capital has been disproportionately allocated into supporting restaurants that are intended to act as loss leaders for hotels or casinos, the evolution of culinary technique has been interrupted, and as a result. one can count the number of important French chefs that first appeared on the scene over the last 10 years on a single hand. Over the past few years, I have found myself in the midst of more than one argument about whether cuisine needs to be representative in order to have any value. Putting that it in simple terms, does food have to actually taste good in order to be considered good cuisine? It's a question that my friend Gary Allen Fine often asks. But then again, he's a sociologist so he is prone to asking those types of questions. But the truth is it's a valid question. Since the standard used by most food writers use is conclusory, meaning they base their review on the final taste of a dish, there is little room in their analysis for deconstructing a dish into its various parts in order to offer a more nuanced analysis. But this is not the case in other forms of criticism. How often do you see a review of a film where the writer lauds a single aspect of a film like the plot or the cinematography in the context of giving a film a mediocre, or even a bad review? A dish that has the potential to inspire this debate in cuisine is Wylie Dufresne's foie gras knots. It's a simple enough concept. You take foie gras and add an enzyme that allows it to become flexible so you can cut it into long strands and tie it into knots. Those who insist on viewing cuisine though a lens of tradition would quickly dismiss the dish because the focus isn't on the quality of the ingredients, but on the effect caused by what has been added to the ingredient. And while I understand why people lodge that particular complaint (In fact I've offered it myself,) it's also wrongheaded to dismiss on that basis alone as the does make an aesthetic statement. In fact, my friend Gary and the other sociologists who are reading this post would say that the fact that Dufresne's dish has in part caused this discussion, is proof in and of itself of its aesthetic value. If I read one more thing about the online reservation system at Momofuku Ko I think my eyes are going to bug out of my head. But despite the consternation surrounding the issue, it does give me the opportunity to discuss reservation systems in general, and how systems that impose some sort of limitation in terms of when you can reserve a table are inherently unfair to a customer. Yes I know, restaurateurs claim that systems that have an outside cutoff date are the fairest way to dole out reservations to those who want them. But as you will learn when we examine how these systems work and what they are really intended to accomplish, they have an intended purpose which has nothing to do with fairness. There is a clear correlation between a restaurant taking reservations and the level of food that they serve. For example, people who go to Chinatown on a Saturday evening are perfectly willing to wait an hour and a half for a table because the delicious food comes at a delicious price (typically $30 a person or less.) But if the same people were going to spend $75 on dinner rather than $30, waiting in line for a table would be unheard of. That's because subsumed within the $75 price of a meal is the cost of a reservationist who answers the phone, and who inputs your reservation into the system. Like anything else in life, the more you pay, the more you usually get. If one were to amortize the cost of that reservationist and reservation system on a per meal basis, how much could it cost the restaurant? A few cents? Could it be $.50 or $1.00? I can't imagine that it would cost anywhere that much. So if the cost of offering your customers the ease that comes with a reservation system is so cheap, and the reality is, they end up paying for the cost because you pass it onto them anyway, why not make their lives easy and offer them the ability to make a reservation? Not that long ago, a new restaurant opening in New York City meant that investors had funded a seven figure installation as well as huge overhead for staffing the kitchen and the front of the house. But over the last few years, many young chefs and entrepreneurs have shunned large capital investments and instead have been opening smaller restaurants featuring cuisines that are based on top quality market ingredients combined with highly competent cooking. Restaurants like Prune, Tia Pol, Spotted Pig and Degustation are a few that come to mind, where the chef is talented enough to be running a kitchen that turns out 200 or more dinners a night, but who have chosen to work in a setting that is not much more than a bar or pub serving between 50-100 covers a night. One of the best restaurants to open in the genre was Resto, which is sort of half bar/half restaurant, and which resides in the middle of E. 29th St, equi-distant from Park Avenue South and Curry Hill. Resto's chef is Ryan Skeen, who for some reason that has never been properly explained, decided to showcase his talent through the prism of Belgian cuisine. But for many of us who are familiar with the restaurant, the Belgian theme is almost an affect and the real draw at Resto is the superb ingredients that Skeen sources from various producers in the Northeast. For example, I have no hesitation to say that his 28-day aged Cote de Boeuf from Four Story Hill Farms is among the five best steaks one can get in New York City. That he serves it with a nice, bitter greeens, and some very good double cooked fries with mayonaisse (otherwise known as Belgian style,) only adds to the gustatory pleasure. "According to the New York Sun, Plotnicki makes no attempt to dine anonymously--his goal, he says, is to "elicit the best possible meal that a restaurant has to offer and in that context anonymity actually hurts instead of helps." Of course it does. That's the point--if you're reviewing a restaurant, you should try to have the experience most diners are likely to have. Even if the quality of food and service are likely to vary from customer to customer, seeking preferential treatment is pretty sure to skew a review. Or a restaurant guide." Later that day, a second review from a Chicago writer appeared, this time by Michael Nagrant who was writing for Hungrymag.com. Nagrant amplified that same theme, going as far as calling me a shill, and he even went as far as saying that you couldn't trust the way I tabulate the results of my survey because of my relationships with various chefs. Fortunately Josh Ozersky took them both to task in a short piece he wrote in response to Thiel's and Nagrant's posts on New York Magazine's Grub Street. Go Josh! Not only does New York City have better restaurants than Chicago (as determined by the OAD survey,) it appears it has better journalists! But seriously, I'm sure both Thiel and Nagrant are nice enough people and meant no harm to anyone. And Nagrant was nice enough to post my response to him as a comment on his blog. But they both failed to grasp what is a significant distinction between the situation they are describing, where a journalist receives an atypical meal that is not generally available to the public, and what I do which is to search for the atypical meal that is generally available to the public, providing one knows how to ask for it. Back in the old days, when people knew a lot less about food and when a big night out meant eating a rack of veal with a fancy sauce at Chez Ordinaire which was run by some guy named Claude or Marcello, there was a concern that if a restaurant owner knew that a reviewer was in the house, he would run out replace his $4 a pound veal with $5 a pound veal in order to get a better write up. I always found that claim amusing as where on earth would you find $5 a pound veal at 9:30 at night? But in these times, when the competition between restaurants is so fierce, and where the purveyor of the ingredients is often printed right on the menu, and when critics are able to taste the difference between beef that is sourced from Niman Ranch as opposed to Brandt Ranch (at least they are supposed to be able to tell the difference,) why are we still concerned about a chef playing a shell game with their ingredients? I once discussed the topic with Tom Colicchio who told me, "What can I do if I know a reviewer is in the house, serve him a center cut veal chop rather than one of the ends?" The truth is, the chefs and restaurant owners all know what the reviewers look like anyway. But even if they didn't, do we really think that chefs are dishonest? I know a lot of chefs and I can't think of a single one who would pull that type of stunt even if they could. I mean if there are culprits here, it certainly isn't food writers who are merely trying to convey information to diners. But I guess maybe Thiel and Nagrant really believe that chef's will cheat given the chance. Or maybe they already know some dishonest chefs. If that is the case, it's time to name names. Or maybe Thiel and Nagrant, and other food journalists, are blindly following a rule that is antiquated and doesn't make sense in a contemporary context. Isn't it time that the food press re-examined this silly practice?